When planning for a business move, integrating branding with design is likely the last thing on your mind. However, having a cohesive brand in your new commercial space can go a long way towards gaining new customers. Today, branding is about a lot more than just sending a logo out into the world. Branding must support an overall business culture that shows customers both your expertise and transparency. The most effective branding will tell a compelling story which is one of the top reasons customers continue to purchase from specific vendors—even when prices rise. So how does branding affect your office design? Regard your new space as a living, breathing logo that will entice customers. Google, for example, is well known for their funky and modern workspaces. These dynamic designs aren’t only for the employees’ benefit. They are sending a strong message to clients that they are forward thinking, fun, and people-focused. Design is a huge part of a company’s brand. 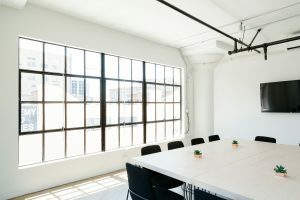 If a customer visits your business and the interior looks like a thousand other office buildings, what you have to offer might get lost in the monotone decor and whitewashed walls. Create some visual interest within your office that reinforces your company logo and clearly demonstrates the culture of your business. For example, if your business is a respected information source, try to create an academic feel in your common and public spaces. If your business is more like Google, emphasize a fun and easy experience by making your design modern and engaging. You don’t necessarily need to spend a huge amount of money on demo or new construction either. Simply applying a new coat of paint or investing in a specific style of office furniture can completely alter the feel of your space. These subtle changes are meant to more easily connect your business to clients. More than ever, customers want to relate to the businesses with which they associate. They want to see its personality and they want to enjoy interacting with that personality. You don’t have to change your entire business model, merely alter your presentation. Again, this can be as easy as a fresh coat of paint or a more personable company sign. MoveMyBiz’s best advice? Don’t do it alone. To successfully integrate your updated brand into the office design, you will want to consult a marketing or branding expert as you plan. It’s best to form a team of design, branding, and marketing experts to ensure that the message you want to give your customers is demonstrated clearly through design. It’s a new world for businesses out there. It’s imperative that your clients can relate to you in all ways possible. Business relocation is the best time to make these adjustments and gain more loyal (and simply more!) clients. Don’t waste this opportunity to make the most out of your new space.